The Marvel Cinematic Universe unleashes it’s world renown crime fighting team to destroy Ultron, the world’s latest evil force in Avengers: Age of Ultron. 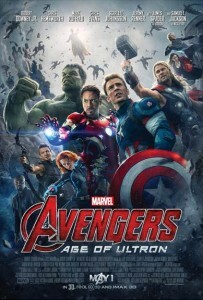 Marvel Studios build upon their successful epic action-adventure feature film The Avengers with a new sequel. Marvel Studios reunites their Super Hero dream team to protect world peace against Ultron’s threat to the human race. President of Marvel and “Avengers: Age of Ultron” producer Kevin Feige explains, “The fun of Marvel films and in particular The Avengers series is that it is not just the spectacle, it is not just the superpowers, it’s having all of these amazing characters interact with each other in a way that they can’t in their own individual movies.”–Ironman(Robert Downey, Jr), Thor(Chris Hemsworth), The Incredible Hulk (Mark Ruffalo), Captain America (Chris Evans). The use of humor is their clever way to interaction with each other. It’s relatable, endearing and more than comical. Based on the Marvel comic book series, first published in 1963, the Marvel Avengers were last brought together to fight against the catastrophic events of the Battle of New York in Marvel’s cinematic Universe. Whedon expands the job opportunities for the global Super Heroes. He opens the door for them to team-up with old friends and their supernatural powers: Clint/Hawkeye (Jeremy Renner), Natasha/The Black Widow (Scarlett Johnasson), Col. James “Rhodey” Rhdes/Iron Patriot (Don Cheadle) and The Vision (Paul Brittany). Whedon then adds a different type of super powered talent to combat evil. Reluctant, the dream team eventually sees the value of adding to it’s ranks. Ironman/Tony Stark (Robert Downey, Jr.) tries to restart a peacekeeping program but fails. In the meantime, a mysterious villian, Ultron, emerges on the scene solely to destroy all human life. Ultron is terrifying, smart and highly technological. Ultron is clear to point out that not only is his aim to destroy human life but states that his path to peace is the extinction of The Avengers. The world as the superheroes know it is in grave danger. Their existence as well. The Super Hero global fighters reassemble in order to stop Ultron from carrying out his plan of destruction. In the midsts of an all out war against Ultron, The Avengers meet up with their old friend, Vision (Paul Brittany) in a new form and a set of twins, Wanda (Elizabeth Olsen) and Pietro (Aaron Taylor-Johnson) Maximoff who prove to be one of their greatest assets in their fight against Ultron. An epic adventure unfolds on an unprecedented global scale for an action-packed thriller.